We’d love your help. Let us know what’s wrong with this preview of Mummy Congress by Heather Pringle. To ask other readers questions about Mummy Congress, please sign up. Creepy yet very informative. The kind of information that you can get only from actually reading a book. You see, there is not too many mummy experts in this world. Mummy experts are those who work on this solitary and thankless job: studying the mummies around the world. They dissect the long-dead and determine how long they have been dead, what was done to their body that they were able to defy the natural process of decomposition, the cause of their deaths, etc. In doing these, they hope to un Creepy yet very informative. The kind of information that you can get only from actually reading a book. You see, there is not too many mummy experts in this world. Mummy experts are those who work on this solitary and thankless job: studying the mummies around the world. They dissect the long-dead and determine how long they have been dead, what was done to their body that they were able to defy the natural process of decomposition, the cause of their deaths, etc. In doing these, they hope to unlock the secret of body preservation and hopefully to also discover some knowledge of how they, our forefathers, lived their lives. They love mummies as Heather Pringle, Canadian non-fiction writer, journalist and archeologist, wrote: ”Mummies have always spoken to us on some deep primal level, and we are simply unable to leave them alone. We love them and we fear them, we aspire to be them and we dread that fate. But one thing is certain: we are powerless to resist their potent appeal" (pp. 338-39). The story started with the mummy congress in Arica, Chile (where the earliest known mummies, the Chinchorro, 5000 to 3000 B.C was examined) and ended with Pringle, looking forward to the next congress in Netherland. In between, were her trips to the mausoleum in Italy where the medieval saints are entombed. Then to the mummies in Netherlands were the long-dead seemed to have the marks of brutal deaths. Then to Peru where they studied the mummy of an Inca princess that was preserved in ice. The book also mentioned the different ancient ways in preserving the body some even used some parasites to prevent the composition, some used quick-freezing (cryogenics), some used complete dehydration and some used unknown herbs and chemicals like the Egyptian mummies. I used to think that this kind of practice was only done in Africa or Middle East. This book taught me that there were also mummies in North America, Alaska, Europe and Japan. I was waiting for Pringle to mention the Philippine mummies lying in the hanging coffins in Sagada, Mountain Province but she did not. In fact, the only mummy that I’ve seen with my own two eyes was the centuries-old mummy that is on display in the Provincial Capitol of Benguet in La Trinidad when I was in college. The mummy is in a glass case and sitting all by herself under the map of Benguet at the lobby of the provincial hall. There is also a chapter on the preservation of Lenin’s body during the Russian Revolution. This reminded me of the preserved body of Mao Tse Tung that I saw during my visit to Tiananmen Square in Beijing in 2001. Here in the Philippines, the body of the former President Ferdinand Marcos is still to be buried 22 years after his death in Hawaii in 1989. For those who love zombies, I suggest that they try this book. The mummies look like zombies. The only difference is that they don't move and chase you. Rather, you will learn a lot about the long-dead instead of the fictional un-dead. You will get scared too but not silly scared. Rather the smart scared. Science journalist Heather Pringle provides a lively and entertaining report on the status of mummies in the new millennium. Filled with history, clever character sketches, curiosities and fascinations - the pages turn at a swift clip to address not only the Egyptian standard, but mummies from around the globe. Were you aware of the discovery of an entire community of well-preserved Caucasian corpses (circa twenty-first century B.C.) in the northwestern corner of China? Good, because the Chinese Science journalist Heather Pringle provides a lively and entertaining report on the status of mummies in the new millennium. Filled with history, clever character sketches, curiosities and fascinations - the pages turn at a swift clip to address not only the Egyptian standard, but mummies from around the globe. Were you aware of the discovery of an entire community of well-preserved Caucasian corpses (circa twenty-first century B.C.) in the northwestern corner of China? Good, because the Chinese government would prefer you not be. What's going on with Lenin's remains in light of the collapse of the Soviet Union? What about those bodies rising from the depths of Britain's bogs? The Roman Catholic Incorruptibles? Is there still a black market mummy trade? Cryogenics, anyone? We are weird, weird people and mummies serve to celebrate this. So climb aboard the crazy train for roughly three hundred pages. Might as well have fun with it. Once upon a time, I trained to be a bioarchaeologist in college, with a specialty in mortuary archaeology. As such, this book is certainly right up my alley - it's effectively a "How It Works" for these particular fields. This book is a fascinating, in-depth look at the world of bioarchaeology and how it pertains to the study of ancient human remains. The focus is, as the title implies, mummies. If you find mummies, death rituals and funerary rites, or relatable popular science tales interesting, Once upon a time, I trained to be a bioarchaeologist in college, with a specialty in mortuary archaeology. As such, this book is certainly right up my alley - it's effectively a "How It Works" for these particular fields. I had no idea there would be so much to learn about mummies. The author is a freelance science writer who learns of a little-known conference, the World Conference on Mummy Studies, being held in a remote region of Chile, and promises her editor she’d bring back a story about a mummy coming to life if he sends her. That story didn’t happen, but what she does find is a passionate group of specialists devoted the preserved dead. She spends the next year visiting these scientists around the world t I had no idea there would be so much to learn about mummies. The author is a freelance science writer who learns of a little-known conference, the World Conference on Mummy Studies, being held in a remote region of Chile, and promises her editor she’d bring back a story about a mummy coming to life if he sends her. That story didn’t happen, but what she does find is a passionate group of specialists devoted the preserved dead. She spends the next year visiting these scientists around the world to learn more about their work. Her somewhat chatty writing style makes mummy science understandable to the layperson. We learn about the (sometimes questionable) relics of medieval saints preserved in European cathedrals, a frozen Inca “princess” on display in Argentina, Japanese monks who strive to mummify themselves, the Russian’s frantic attempts to keep the bodies of Lenin and Stalin viewable, what the bog bodies reveal about life and society in Northern Europe in ancient times, how Egyptian embalmers were so skilled that there are more Egyptian mummies than any museum can handle, and more. Perhaps the most gob-smacking was the Victorian pastime of attending “mummy unwrappings” during the height of Egyptomania. The book is really about our varying degrees of comfort with death through over time and in different cultures. Some mummies, like the Inca princess and Otzi the iceman, are accidental due to climate. Others, such as King Tutankhamen and Lenin, are deliberate. All of them can reveal clues about our past. The World Conference on Mummy Studies has a Facebook page. Check it out! Mummies are always fascinating to me, at least in non-fiction, and this book was especially so because it covers a lot of ground, from Inca child sacrifices to Stalin to ancient bog bodies. It’s the kind of book I love, with something new (but related) in each chapter, introducing new sites and concepts I wasn’t aware of without going into any one thing exhaustively. I found myself googling for images to match the text. The only thing I would really criticise is the hyperbolic breathlessness abou Mummies are always fascinating to me, at least in non-fiction, and this book was especially so because it covers a lot of ground, from Inca child sacrifices to Stalin to ancient bog bodies. It’s the kind of book I love, with something new (but related) in each chapter, introducing new sites and concepts I wasn’t aware of without going into any one thing exhaustively. I found myself googling for images to match the text. The only thing I would really criticise is the hyperbolic breathlessness about how some of these mummies “look as if they were alive” or “wouldn’t look out of place on the street”. No, the preservation is amazing, but I have yet to see a mummy that is truly so immaculately preserved that it wouldn’t stick out like a sore thumb trying to walk around the streets. The faces are sunken, the jaws and teeth and cheekbones too prominent, etc, etc. They’re obviously dead. I find I have more respect for them while recognising that they’re dead than trying to pretend that they look just as they did when alive. They don’t. There’s an amazing amount to be learned from some of these bodies, and Pringle does a great job of showing some of the breadth of what’s out there and what questions we need to ask. Pringle attends a conference on mummies (The Mummy Congress) and pursues the topics presented in papers at the conference. Her research takes her to the tombs of Egypt to the bogs of the Netherlands to the peaks of the Andes. An enjoyable approachable read. I’m interested in pursuing what further research has been done since 2001 (publ date) on several of the famous mummies mentioned in the book. I really appreciate my colleague Tony thinking to loan me this book. I love detailed accounts of obsessive subcultures and the insular, scientific world of mummy specialists qualifies. This was a thought-provoking work. One of the controversies in the field is whether to do destructive autopsies on mummies. I had hoped for a middle ground: at most use the accurate, tiny tools of laparoscopic surgery and digital laparoscopes. However, a close look at the work of an avid dissector convinced me: to I really appreciate my colleague Tony thinking to loan me this book. I love detailed accounts of obsessive subcultures and the insular, scientific world of mummy specialists qualifies. This was a thought-provoking work. One of the controversies in the field is whether to do destructive autopsies on mummies. I had hoped for a middle ground: at most use the accurate, tiny tools of laparoscopic surgery and digital laparoscopes. However, a close look at the work of an avid dissector convinced me: tools for mushy bodies don't work in dessicated corpses hardened to resin. Not fully exploiting some corpses misses unique discoveries like the example of an entire workman's shirt hidden in the wrappings. Other myth's exploded: Twain probably made up mummies as locomotive fuel (I had thought as much) and there never was paper made from mummy linens. This despite its inclusion in multiple histories of paper making. I never watched the TV documentary on "cocaine mummies", but the discovery of THC and cocaine traces in the hair of Peruvian and Egyptian mummies made me want to believe partying elite were sending brickes of coke and bales of marijuana to each other across the southern Atlantic. But, apparently such trips were not possible at the time and such assaying only tells us how littel we know about the chemical processes involved. The title refers to a regular meeting of mummy experts and the author, a report for a magazine, attended and following the "threads" from one year to track down those active in the "fields" of bogs, Valley of the Kings, Incan repositories and more. A chapter near the end on the ruthless, police state tactics South American missionaires took to destroy Incan mummy culture, a culturally important form of ancestor worship, was among the most repulsive material of a work that goes for the visceral. There is something missing from the heart of this book, something vital that would push it over the edge and into something great. There is certainly nothing wrong with the writing, which is friendly and accurate. The descriptions and characterizations are detailed and engaging. Neither is it the topic, because Pringle found plenty of interesting and surprising anecdotes to fill the pages. Instead, I feel it was the episodic approach the book takes to the topic, moving from one variety of mummy There is something missing from the heart of this book, something vital that would push it over the edge and into something great. There is certainly nothing wrong with the writing, which is friendly and accurate. The descriptions and characterizations are detailed and engaging. Neither is it the topic, because Pringle found plenty of interesting and surprising anecdotes to fill the pages. Instead, I feel it was the episodic approach the book takes to the topic, moving from one variety of mummy to another and into a cultural assessment. By limiting our exposure to any one researcher and their particular specialization we are trapped in a book that essentially restarts every chapter and changes direction. 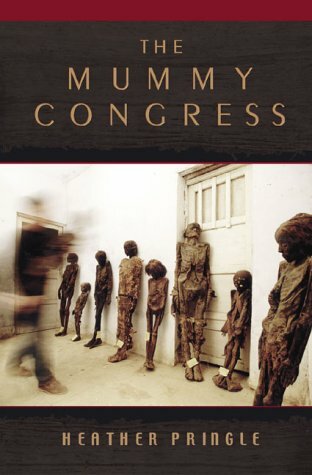 The hook that all these episodes are supposed to hang on is the eponymous "Mummy Congress" in Arica, Chile, but after the first chapter the importance of the congress simply vanishes into occasional mentions. This was disappointing because the congress was what piqued my interest in the book, and I was hoping for a report from the congress, rather than it being the weak link holding the book together. Then there is the matter of the age of the book. I hate to admit it to myself, but 2000 was a long time ago, especially for a book reporting the cutting edge of research in a field where one discovery can change everything. I expected something very different from what I ended up reading when I picked up The Mummy Congress. Most reviews led me to believe I'd be reading a mere history of mummies. While the book does give a overview of the history of mummies, it also delves into the odd world of those who study mummies. Through telling the story of these meticulous and eccentric researchers, Pringle reveals the world of mummies to the casual enthusiast. I don't recommend this book to those who are easily grossed out I expected something very different from what I ended up reading when I picked up The Mummy Congress. Most reviews led me to believe I'd be reading a mere history of mummies. While the book does give a overview of the history of mummies, it also delves into the odd world of those who study mummies. Through telling the story of these meticulous and eccentric researchers, Pringle reveals the world of mummies to the casual enthusiast. I don't recommend this book to those who are easily grossed out as the discussion of dead flesh and parasites is not for the faint of heart. I also don't think anyone who has more than a passing knowledge of mummies will find this book very enlightening. It is informative but sort of just skims the surface and paints a picture rather than really offering a comprehensive study of mummies themselves. After Heather Pringle attended the Mummy Congress, an academic convention for the archaeologists and others who specialize in the study of mummified humans, she was so fascinated that she sought out experts in the field to help satisfy her curiosity about mummies. Along the way, she also reflects on why we are so fascinated by mummies, and what that fascination has historically meant for the treatment of mummified humans. This is a really interesting book, since it reveals the scope of mummy res After Heather Pringle attended the Mummy Congress, an academic convention for the archaeologists and others who specialize in the study of mummified humans, she was so fascinated that she sought out experts in the field to help satisfy her curiosity about mummies. Along the way, she also reflects on why we are so fascinated by mummies, and what that fascination has historically meant for the treatment of mummified humans. This is a really interesting book, since it reveals the scope of mummy research -- mummies aren't just in Egypt, they have been found all over the globe. Sometimes I was frustrated because I really wanted to spend more time on the individual cases, but since it's sort of an overview of the field it's not possible to cover everything there is to know about the various archaeological sites. I recommend this if you have an interest in archaeology and share my fascination with eerily well-preserved human remains. I found this book at a yard sale, the cover title caught my eye., so for 25 cents why not. I really enjoyed it. Loved that I got a glimpse into the world of mummy studies. Because it was not written by a scholar it was pleasure to read. As a child I read a piece of fiction that was written about a mummy and how the author thought she came to be in the bog. I loved that book and have read anything about mummies since. I should preface this by saying that I have been somewhat obsessed with mummies myself since at least the 4th grade. So to find a book that was all about mummies- but written for adults and not 4th graders was exciting. I learned so many interesting things reading this book- my favorite being that they used to make paint out of ground up mummies. But I think what I appreciated most was the look at mummies globally (not just Egyptian mummies) and what we are learning from them scientifically. I really enjoyed this book and learned a few things too. The text is easy to understand for someone outside the fields of study covered in this book. I like how each chapter is focused on one topic rather then trying to write a chronological piece. Being able to focus on parasites for an entire chapter made reading much easier than having to keep track of a bunch of names and dates. Fascinating book. The pictures included are surreal. So many of the mummies pictured have been preserved so well that it is almost unnerving. Great information included and very interesting facts about mummies, archeaology and humanly preservation. One of the most enjoyable and fascinating books I've read in years. If you've even a passing interest in mummies and the history of cool skeletal discoveries, you owe it to yourself to read this book! Devo ammettere di aver provato una certa ripugnanza nell'aprire questo libro (l'ho comprato nel mio solito "scouting" di letture interessante - compro e accumulo, poi leggerò). Comincia parlando di convegni sulle mummie (si potrebbe dire, ma chi se ne frega? ), in realtà tra le pagine di questo libro si nasconde una serie di informazioni interessanti, sulla chimica del corpo umano dopo la morte, informazioni sulle mummie (le ricerche della Balabanova sulle mummie egizie) e una serie incredibile di informazioni sulle società antiche. In particolare il THC, la cocaina e la nicotina trovata nei capelli delle mummie egizie hanno scatenato tutti quegli scrittori come Hancock che con forza continuano con urlacci muti dai loro libri che gli Egizi hanno avuto contatti con il Nuovo mondo prima ancora di Colombo (alla fine, è molto più probabile che le tracce trovate nei capelli fossero in realtà da inquinanti atmosferici, la nicotina è presente in piccole tracce nei cibi, la cocaina un po' meno, ai tempi degli egizi, ma dopo secoli dalla mummificazione, è difficile stabilire come si sono degradate le sostanze nei capelli delle mummie). Molto interessanti le mummie delle torbiere nel nord Europa. Forse parlano di sacrifici umani, quando la società germanica fu scossa dall'arrivo dei conquistatori latini. Parecchio interessanti le mummie di razza caucasica nell'asia centrale, che parlano a distanza di secoli di una storia antichissima non riportata nei libri, di questi popoli che una volta domati i cavalli, hanno portato la tecnologia a oriente e hanno colonizzato l'Europa. Del resto, questi corpi antichissimi potrebbero essere la base da cui sorgono tutti i miti dei popoli venuti da lontano a insegnare la civiltà: la Cina possiede leggende simili, anche se si ostinano a volersi considerare una nazione isolata dall'Occidente che ha sviluppato una cultura e una tecnologia e un impero con le proprie forze soltanto. Assai più interessanti le mummie del comunismo, e le squadre dei "mausoleisti" che trasformarono Lenin e Stalin in ottime relique. Scade un po' sul finale, quando alla fine l'autrice si dilunga in una non strettamente necessaria considerazione su ciò che rappresentano le mummie per noi, nella sostanza una forma di immortalità (per chi è un po' più spirituale, la morte non sembra così spaventosa); e questo (sempre per l'autrice) è il motivo per il quale ci teniamo in forma con palestre e alimentazione (io da taoista direi che il cibo è la medicina da usare con moderazione per tenersi in salute e rallentare l'invecchiamento, e la palestra, da uomo pragmatico, è un "use it or lose it"). Nel complesso, un'ottima lettura. A fascinating overview of humanity's global fascination with mummies told by the scientists, anthropologists and researchers who dedicated their lives to the study and care of the ancient dead. Going in, I thought this book would focus on Egyptian mummies only, and be more of a general overview of the world's (though mostly white Europe and America's) obsession with them. I was so wrong--the book spends surprisingly little time in Egypt for a book about mummies. Pringle goes from Egypt to China A fascinating overview of humanity's global fascination with mummies told by the scientists, anthropologists and researchers who dedicated their lives to the study and care of the ancient dead. Going in, I thought this book would focus on Egyptian mummies only, and be more of a general overview of the world's (though mostly white Europe and America's) obsession with them. I was so wrong--the book spends surprisingly little time in Egypt for a book about mummies. Pringle goes from Egypt to China to Chile and to dusty attics in America to find out why these ancients were preserved. But more importantly, she turns a critical eye on what these ancient dead mean to us religiously, culturally, and personally. It was a fascinating book, and I was glad she spent a significant time detailing the western imperialism and colonialism that has dominated so much of the world's understandings of mummies. Saggio molto bello, coinvolgente e ben scritto sul mondo delle mummie. Ma, soprattutto, un libro non banale, con considerazioni e osservazioni molto acute. Utterly charming book about mummies. A resenha de hoje vai causar um grande estranhamento para aqueles que vem aqui esperando resenhas de romances da Meg Cabot e da Carina Rissi. Por vezes, eu deixo escapar aqui que tenho um gosto secreto por livros de não-ficção – são um dos meus guilty pleasures! Já resenhei livros científicos e engraçadinhos como o “E Se?” e o “Stiff: The Curious Life of Human Bodies“. “O Mundo das Múmias”, de Heather Pringle, dá um pouco de continuidade ao que eu aprendi com “Stiff”. Se neste, falávamos sobre ca A resenha de hoje vai causar um grande estranhamento para aqueles que vem aqui esperando resenhas de romances da Meg Cabot e da Carina Rissi. Por vezes, eu deixo escapar aqui que tenho um gosto secreto por livros de não-ficção – são um dos meus guilty pleasures! Já resenhei livros científicos e engraçadinhos como o “E Se?” e o “Stiff: The Curious Life of Human Bodies“. “O Mundo das Múmias”, de Heather Pringle, dá um pouco de continuidade ao que eu aprendi com “Stiff”. Se neste, falávamos sobre cadáveres e pessoas que doaram seu corpo à ciência, no livro de Pringle descobrimos mais sobre pessoas que doaram seus corpos à história – sem querer, né? O livro começa com a jornalista Heather Pringle em um Congresso de Múmias, no Peru. Nele, a jornalista acaba descobrindo todo um nicho secreto: Pesquisadores que estudam o cabelo de múmias, para saber o que elas comiam e se elas usavam drogas, corpos incorruptíveis, aqueles que não apodrecem, e que, por isso, foram canonizados pela Igreja Católica, múmias de crianças incas que ainda têm os cílios e até mesmo estudos sobre o corpo de Lênin, que foi embalsamado e até hoje tá lá preservado. O livro é bem doido. Mas é fascinante. Pringle vai tecendo, à partir do Congresso, uma narrativa que te leva por várias partes do mundo e que aborda de maneira clara, abrangente e, por vezes, cômica, o estranho hábito que nossos antepassados tinham de preservar seus corpos e se manter “em forma” para a próxima vida. Monges japoneses que tentaram mumificar a si mesmos, os embalsamadores de Stálin, múmias chinchorro e até mesmo corpos do pântano são analisados pela autora, que, com o auxílio de outros pesquisadores, monta um passado e até uma breve “análise” de como essas pessoas morreram. The book is interesting and a leisurely read until it reaches it’s closing arguments, which are terrible. Over all the book is an a hap-hazard investigation of the of a number of fields within mummy studies and archeology. It seems that Pringle has selected the juiciest and most grotesque aspects of the field to detail as both a self-aware pandering to the public and her own morbid fascination in the topics. Pringle looks into the public’s morbid fascination with mummies as well, and concedes th The book is interesting and a leisurely read until it reaches it’s closing arguments, which are terrible. Over all the book is an a hap-hazard investigation of the of a number of fields within mummy studies and archeology. It seems that Pringle has selected the juiciest and most grotesque aspects of the field to detail as both a self-aware pandering to the public and her own morbid fascination in the topics. Pringle looks into the public’s morbid fascination with mummies as well, and concedes that her novel not only steams from this interest but will further contribute to the public craze. Some of the most interesting topics are; the ancient dead and recreational drug use, paleopathology/ancient viruses, and the child mummies/sacrifices covered in clay from South American. Drug testing on ancient mummy hair has brought up some strange results. Many mummies from Egypt and south american tested positive for cocaine, nicotine, and hemp. What complicated these results, are mummies from different continents are testing positive for narcotics only available in different parts of the world. This findings have many interesting implications. Gut testing on ancient mummies reveal how ancient people lived, ate and died and could offer insights in to deadly mega-strain diseases still present today and that’s pretty cool. Ancient baby mummies from South America are pretty cool too. Some are believed to be human sacrifices, others were lost due to the high infant mortality rates. Pringle describes the reverence and care ancient families took to preserving and visiting their dead. The Mummy Congress is an enjoyable read for mummy aficionados. Topics range from Andean interments to the unexpected Buddhist practices in Japan. I was particularly interested of the Soviet science in human preservation tied to the cult of Lenin, and with the evidence of early European migrations to China. Pringle has done her homework and writes well. This book explained in detail the cultural significance and scientific elements involved in preserving human bodies in places around the world. I hadn't realized how many different cultures practiced preservation of the dead. I appreciated all the research the author did, citing over 4 pages of other books and research journals. There were numerous interviews with cultural anthropologists, pathologists, archaeologists, and biologists throughout the book to make it really engaging and very info This book explained in detail the cultural significance and scientific elements involved in preserving human bodies in places around the world. I hadn't realized how many different cultures practiced preservation of the dead. I appreciated all the research the author did, citing over 4 pages of other books and research journals. There were numerous interviews with cultural anthropologists, pathologists, archaeologists, and biologists throughout the book to make it really engaging and very informative. The author added her own (rather naive and UN-scientific) two cents on about the last two or three pages of each chapter so I just began to skip the last few pages. Some of the most interesting parts of the book were hypotheses about the Silk Road being far more ancient that currently believed, built around the finding of Caucasian mummies in China's Xinjiang region, and the cult-like mania of Russia's preservation of fascist leaders from the 20th century(Stalin, Lenin, Ho Chi Minh, Kim Il Sung). Another interesting detail in the book was the account of one researcher's attempt to establish a connection between the Egyptians and the South American Indians. By analyzing mummies from Egypt and finding traces of nicotine, THC and coca, the researcher claimed the Egyptians must have had trade routes to South America. Found this while browsing the local library's collection under "forensic science". The author starts off with a visit to the Third World Congress on Mummy Studies - a conference for paleontologists, pathologists and anyone else who is interested/obsessed with mummies. She then visits with experts from around the world, visiting China, Japan, South America and (of course) Egypt. Her focus is primarily on current-day studies, although one chapter does deal with the history of Egyptology. One sligh Found this while browsing the local library's collection under "forensic science". The author starts off with a visit to the Third World Congress on Mummy Studies - a conference for paleontologists, pathologists and anyone else who is interested/obsessed with mummies. She then visits with experts from around the world, visiting China, Japan, South America and (of course) Egypt. Her focus is primarily on current-day studies, although one chapter does deal with the history of Egyptology. One slightly off-putting chapter discusses the use of mummies in medicine and even in art - there was actually a pigment called "mummy" made from these ancient remains - it was described as a lovely shade of brown, if I recall correctly. The most fascinating section to me covered dissecting mummies in order to study ancient disease pathology - and how the community is divided on the topic of dissection. I can see both sides of the argument - both the need to investigate the history of disease, but also the fact that these are human beings who have no say in how their remains are being used. Whoever would have thought that a book about mummification could be an engrossing read – and for someone extraordinarily squeamish! “The Mummy Congress” is precisely that. Written in a flowing and gossipy style, the book is about the preservation of the dead, from the rituals of Egypt to our own, modern times; from intentional mummification to that accidental. True, the theme is bizarre and the photographs – well I snipped them out immediately, well I mean! – but what a superb read. One of the mo Whoever would have thought that a book about mummification could be an engrossing read – and for someone extraordinarily squeamish! “The Mummy Congress” is precisely that. Written in a flowing and gossipy style, the book is about the preservation of the dead, from the rituals of Egypt to our own, modern times; from intentional mummification to that accidental. True, the theme is bizarre and the photographs – well I snipped them out immediately, well I mean! – but what a superb read. One of the most fascinating parts is about the maintenance of Lenin’s body and the decades spent to keep him rosy, and fresh and on full view, though I can’t remember if the author mentioned why on earth anyone should ever want to do such an absurd thing. This is a must read for anyone into history. I listened to the audio version of this book, read by the delightfully talented Anna Fields. She made Pringle's hauntingly beautiful writing style come to life. Everything Pringle saw, I saw, with great detail. And Pringle herself has a way of explaining the scientific world with intelligence and comprehendability that makes this book as fascinating as it is relatable; she mixes the science of discovery with the emotions that connect us with these mummies that once walked our Earth. It would not I listened to the audio version of this book, read by the delightfully talented Anna Fields. She made Pringle's hauntingly beautiful writing style come to life. Everything Pringle saw, I saw, with great detail. And Pringle herself has a way of explaining the scientific world with intelligence and comprehendability that makes this book as fascinating as it is relatable; she mixes the science of discovery with the emotions that connect us with these mummies that once walked our Earth.